Water-painted words wash over my screen, casting shadows. as singular tributes to summer. in a Summer Splashings' moment of thought. welcomes Poetry Friday to the Farm. Moving beyond the comfort zone is what educators often ask students to do but how often do we ask ourselves to try something that may be uncomfortable? Yesterday at a regional meeting on Long Island, I asked participants to do this with an activity based on Daniel Pink's one sentence project. Since the exercise was a quick, deep thinking one, the pressure was on. During the turn and talk portion of the collaborative activity, one participant commented, "This task was difficult". I replied, "Moving everyone out of their comfort zone is important." What followed was a great conversation. The administrator willingly share his feelings with the large group and other educators agreed, making this an aha moment. When we push ourselves a bit more than usual, we open the world of the possible. We engage fully in the task as we stop, think, and ink. When we share our written expressions, we listen intently to each other and offer supportive comments. Hopefully, all these steps lead to the broadening of our perspectives. Activities conducted in a culture of trust allow voice to safely rise and risk-taking to be honored. 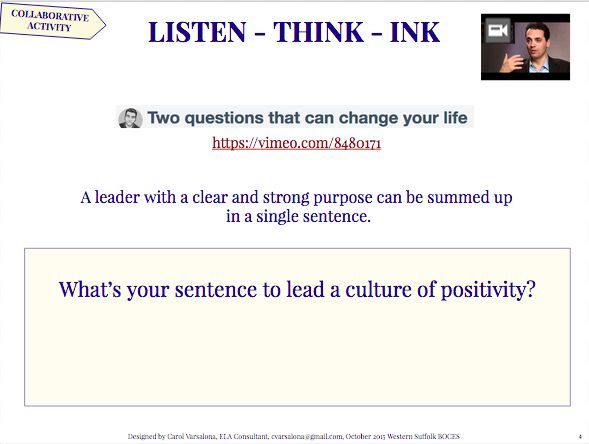 Because of the receptivity to interactive activities, the educators in the room created a first draft of their sentence defining who they are as leaders in a culture of positivity. Here are some samples that were shared on Twitter at #elanetwork. As instructional leaders in literacy, my hope is that we collaborate daily, passionately put ideas on the table, and build cultures of trust to help both teachers and students become more engaged. How do you define yourself as an educator? What is your sentence? 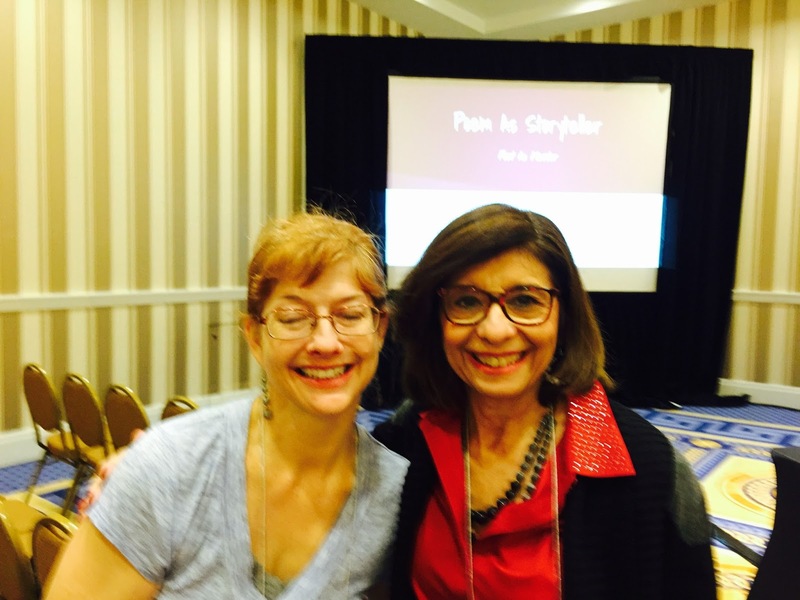 Please visit Two Writing Teachers where you will find the Tuesday Slice of Life. What's a trip without a bit of a ruffle here and there? 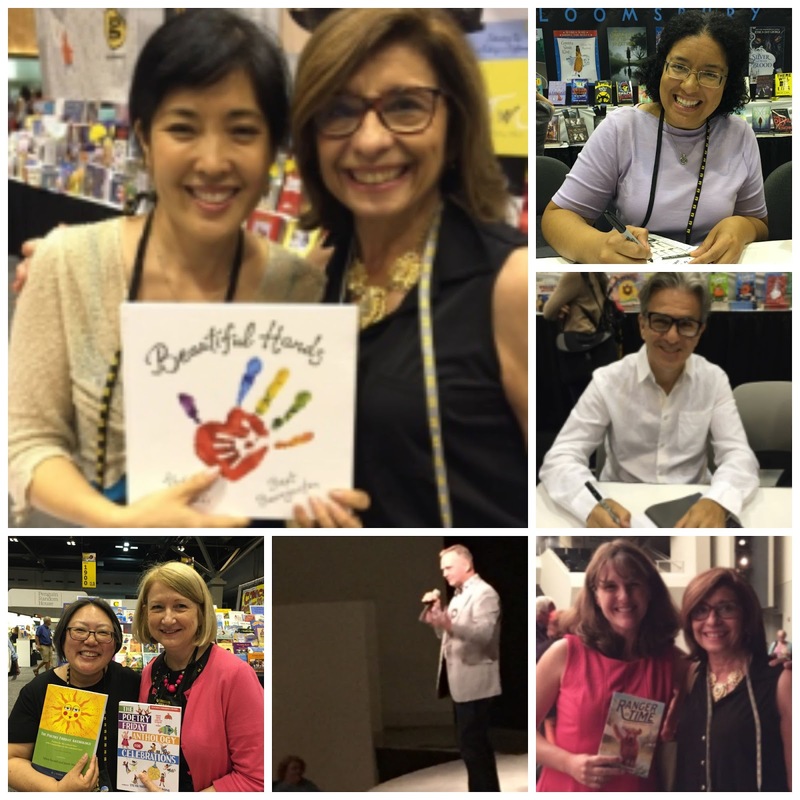 A week after my trip to St. Louis for the International Literacy Association 2015 Conference, I can be a bit humorous about my misadventures, but while traveling there was no laughter involved. In fact, the issues that arose tipped my positivity balance to a negative total. To read Part I of my story you can click here. Part II continues with a few snafus. As I departed the St. Louis Airport, I was immediately struck by a thickness in the air. The heat index was a dangerous high 90 degrees that felt more like 105 degrees. I felt immersed in a wave of intense heat with no breeze at all. This is called "Welcome to the Midwest," as many Missourians told us. I was so glad to be out of the airport with a phone in hand that I tried to ignore the heat as my colleague Michele and I jumped on the Metro to our hotel. Due to the mishaps at the airport, we arrived too late to register for the convention but the cool air in the hotel made up for any discomfort lugging bags from the Metro to the hotel. Remind me not to do that again. After checking in we met up with Laura Purdie Salas, friend and poet whom I met for the first time at NCTE 14. As we strolled down the street in front of the Convention Center we found an interesting Peruvian place to dine. 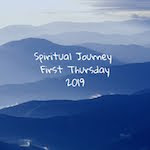 While the food was delicious, the stress at the airport, sinus issues, and eating late kept me from having a full night's sleep, so Day 1 did not sit well. "Books are like fortune cookies. They both have life lessons." Day 2 started out early with the Heinemann VIP Breakfast thanks to Stephen Perepeluk. 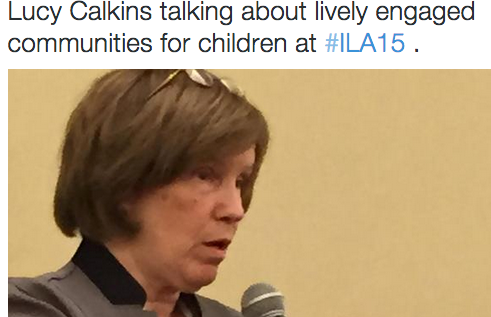 Lucy Calkins was the keynote presenter hosting her own version of a fireside chat in an intimate setting, as she said. While I have heard Lucy speak in various settings for the past 20+ years, this time was special because of the small grouping. An added treat at the breakfast was a gift of a notebook. This became a perfect conference journal. Unfortunately, I left this journal in a session on the last day, so I am relying on my memory to recreate conference moments while waiting for the arrival of my conference notebook. 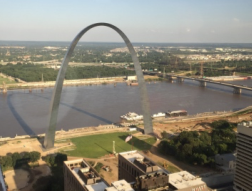 At the start of the conference there were so many decisions to make: which sessions to attend, when to visit the exhibits and stop to eat, and which sights of St. Louis to visit. Michele and I decided to start with a walk to the Arch-a must see tourist spot. The sun was blazing hot in the early morning so the trip was short-lived. When, I arrived back at the convention center, I was greeted with a line into the Exhibit Hall that stretched what seemed to be a couple of city blocks. When I finally arrived at the front of the line, I was ushered into another area to get a "dolphin label" to attach to my rolling cart. Little did I know that I had to declare that I needed a medical clearance to bring the bag into the exhibit area. Positivity undone #2. I was indeed provided the label after much discussion about my torn rotator cuff. Once I was in the hall, the trick was how to maneuver among the hundreds of people storming the doors. Was it Bastille Day, I mused when I saw the crowds trying to enter from all entrance doors? The books in the bag became rather clumsy so a quick trip to the UPS station fixed that dilemma about how to get the books home. The day closed with a walk to the Scholastic Author's Party at Kemoll's, a restaurant in St. Louis with a spectacular view of downtown St. Louis. 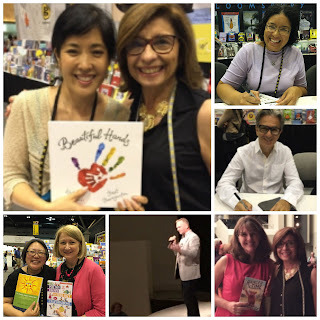 It is always wonderful to sit and talk with familiar Scholastic friends and authors, like Laura Robb, Ruth Culham. 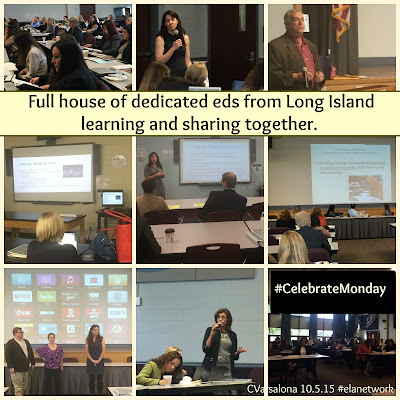 I also met Pam Allyn who agreed to address Long Island educators this fall at our professional development programs. "It is in the hearing of stories that we become fully human." is for yet another day. 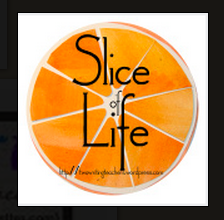 Please visit Two Writing Teachers for the Tuesday Slice of Life. Wherever you live, summer is a time for spectacular photos and celebrations. Families share smiles; friends gather for outdoor events; and nature poses. Each day provides enjoyment. Morning opens the door for summer pleasures. Mid-day heat requires a slowing down of activities and evening allows for reflected moments. Everywhere you go, you can see cameras and phones flickering and videos preserving events. Travel seems rich with unbelievable sights. Cooking and grilling take on new opportunities to dazzle family and friends with fresh delights from the sea or gardens. Even if you do not leave your locale, life seems full because the summer sun shines brightly on each new day. Summer is here and heating up so allow spontaneity, surprise, and endless moments to be savored. This season knows no boundaries. Your weekends can hold endless memories so treasure the leisure time to reflect, explore, and examine life and learning. Be inspired to observe the world with a new lens. Then, when twilight nods, you can sit back to observe the sky. See beyond the colors. Realize that there are dreams caught in between the rays. Find those specks to paint a new picture of possibilities. Rest in the assurance that a new day will dawn and celebrations begin anew. Beyond photography, artwork and digital renderings are welcomed. Dream big so that your thoughts can be beyond the sky and in all the wonder, immerse your senses in what summer holds. Thinkers dream while writers write. It is your time to choose your medium of expression to find pleasure in summer moments that you can send out to the world through Summer Splashings. Below is a teaser for what the Summer Splashings Gallery can hold if you allow your voice to splash across a page. The mode of expression is endless. Artistic renderings can be in the form of free verse, haikus, tankas, inspirational thoughts, or however you would like to express yourself. 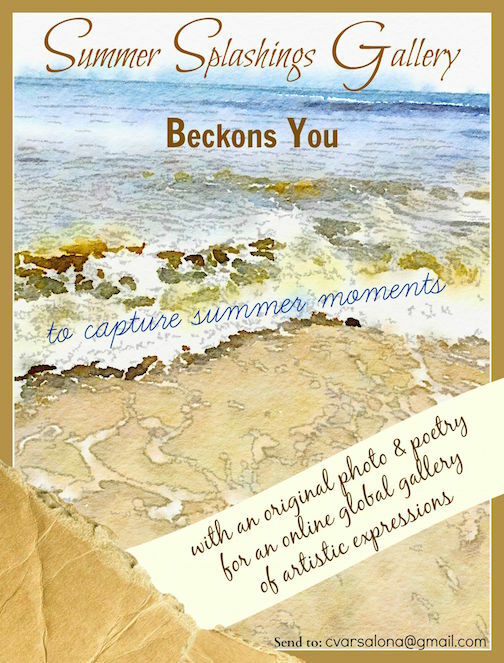 You do not have to be an artist, photographer, or poet to join in the chorus of voices for the Summer Splashings Gallery. You just have to be inspired to create. When complete, you can send your offering on to me for placement in the global gallery that will be unveiled at the end of the summer season. Deadline for submission is the end of August 2015. Think summer thoughts as your create. Find the perspective that suits your style. Be open to sharing what summer offers you. The digital world affords us the opportunity to send our thoughts and images into the Twittersphere. Join me to create a new gallery that will bring inspirational moments to many readers. 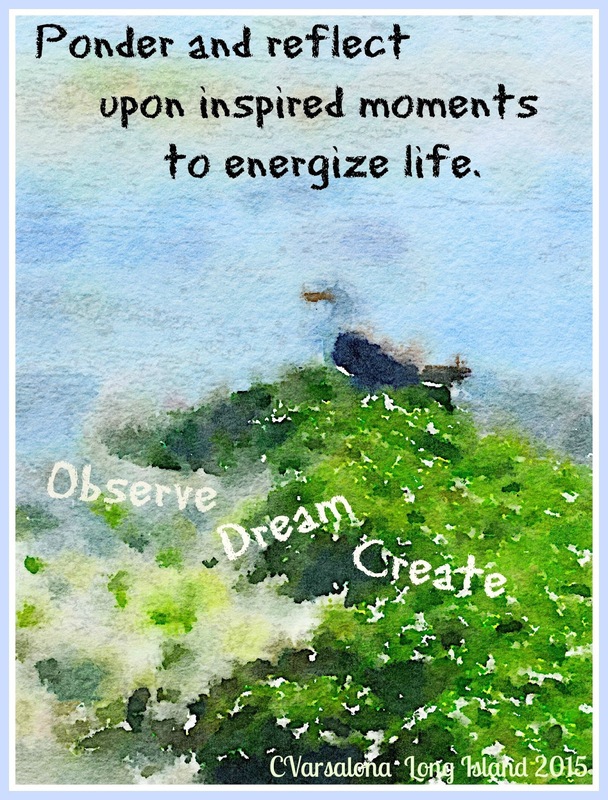 If you would like to see the inspirations of 2014, please visit the Summer Serenity Gallery here. 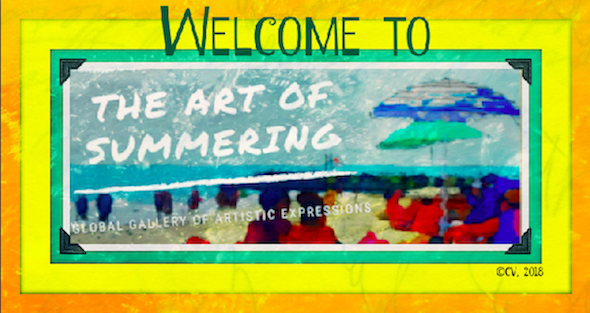 The latest global gallery of artistic expressions, Spring's Symphony, can be accessed here. Since this is a weekend of digital literacy celebrations, I am offering this post and invitation to DigiLit Sunday hosted by Margaret Simon and Celebrate This Week hosted by Ruth Ayres. I am also splashing this post across the Twittersphere to engage the Reflect With Me writers and many others in the creation of the Summer Splashings Gallery. 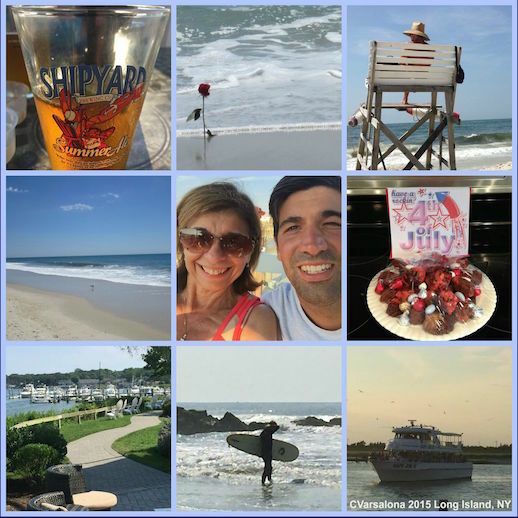 Celebrate Summer Long Island Style!